I sit here typing this, trying to figure out where the heck each week goes. Next week, I move, my son turns 10 months old, and I gradually become my mother. Not that that’s a bad thing, she’s a wonderful mother, I just hear her in my voice all of the time now that I have a kid. This is the truest thing that I have ever written. 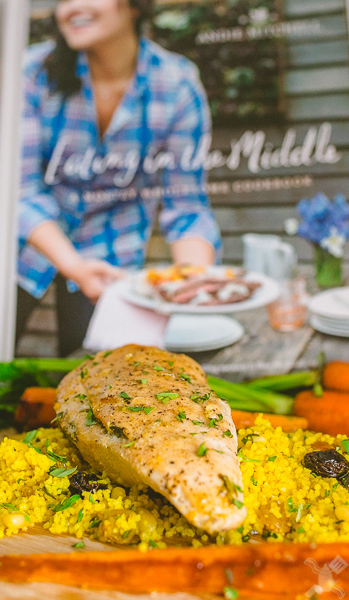 This is part one of a many part series, I will be cooking, reviewing, and sharing from Andie Mitchell’s cookbook, “In the Middle.” She has an amazing story to tell, she lost 135 pounds and not by starving herself. This hits so close to home, because I have to remember to be mindful and to know that there is a middle ground to eating. You guys should check out her blog and learn more about her! Such a beautiful book with amazing recipes and stories! This series will be every other week, so that I won't bore you too much. Plus, I like having an excuse to go out and eat brunch/breakfast places and take photographs. 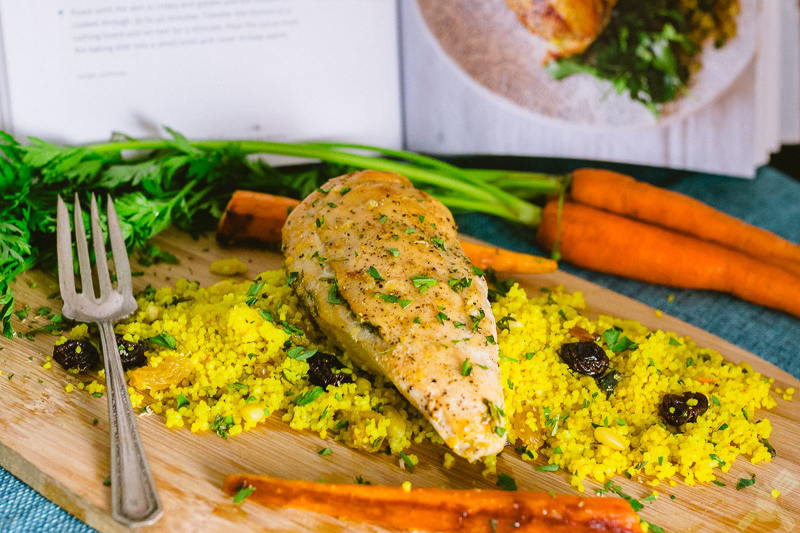 This week, we did the Lemon Roasted Chicken with Moroccan Couscous on page 138. This is a very simple recipe, in my opinion, but it still packs a punch in the flavor department. It was easy to make in just around 35 minutes and Braedon wasn’t too grumpy when I was making it. Fantastic recipe- healthy ingredients, but lots of flavor. Happy Braedon! Working on his smile, mama may have been too close when taking that picture, he looks cross eyed. And other than the pine nuts, which are incredibly expensive for some reason, it’s relatively cheap to make. Braedon ate a whole breast and most of his couscous, in my opinion this is already a winning recipe. I love when my little man eats up his dinner. Look at that kid eat! Gareth, the picky eater, didn’t seem to mind it much either. The chicken was extra juicy because of the chicken jus that you top it off with, it also gives it a little extra kick. Look at all of that yummy stuff on one plate! I really liked the couscous, I mean really liked it. I could probably live off of that for a while. The chicken was really good too, but next time I think I might add just a little bit more garlic than what the recipe calls for. I needed a little more of that flavor to calm the bitterness of the lemon. Overall, I’m going to give this little recipe a 4 out 5 MomNom stars! Check out Andie’s blog and twitter for more fantastic recipes! Place the chicken breasts in a large baking dish. Carefully lift up the skin on each breast and season each evenly with 2 teaspoons of the garlic, 2 teaspoons of the lemon zest, and the parsley. Re-cover the breast with the skin, rub the tops and sides evenly with the olive oil, and season with the salt and pepper. In a small bowl, whisk together the chicken broth, the remaining 1 teaspoon of garlic, the remaining 1 teaspoon of lemon zest, and the lemon juice. Pour into the baking dish around the chicken. Roast until the skin is crispy and golden and the chicken is cooked through, 35 to 40 minutes. Transfer the chicken to a cutting board and let rest for 5 minutes. Pour the juices from the baking dish into a small bowl and cover to keep warm. About 15 minutes before the chicken is done, begin preparing the couscous. In a small pot set over high heat, bring the chicken broth to a boil. Remove to the pot from the heat and stir in the couscous, cumin, coriander, turmeric, lemon zest, salt, and pepper. Cover and let stand for 10 minutes. Fluff with fork and stir in the butter, pine nuts, currants, and parsley. To serve, divide the couscous among 4 plates and top each with a roasted chicken breast. Remove the chicken skin before eating and pour a tablespoon of the reserved pan juices over the top. Are you looking for something else to make this week? Have you checked out the bulgogi tacos that I made on Monday? If not, you really should! Stay tuned on Friday for a guide of what to do in Healdsburg, CA if you find yourself there for 24 hours. Featuring the Dry Creek Kitchen. Follow me on Instagram, twitter, facebook, and pinterest for all of the latest news and updates!